Abstract: This article shows the steps required to create an Entity Data Model which can be used in multiple projects. 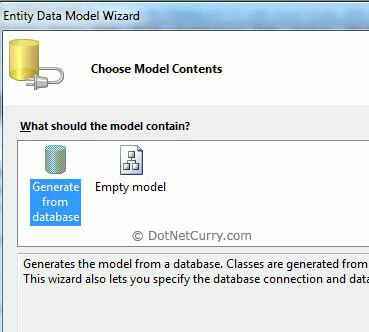 In one of my previous articles, I had written on how to Create an Entity Data Model From a Database. 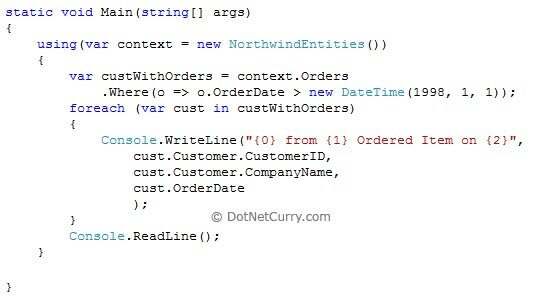 A DotNetCurry.com reader Phillip posted a question in the comments section, asking if it was possible to use the same model in multiple projects. The answer is – To consume an Entity model in separate projects, you have to create the model in its own project, i.e. a class library project. Let us see how. The steps of creating the model is similar to the one I wrote in my previous article, so I won’t be explaining them over here again. Here are the steps to create a model as a separate project. Delete the default Class1.cs that gets created in the project. Step 2: Right click on the project in Solution Explorer > Add > New Item. 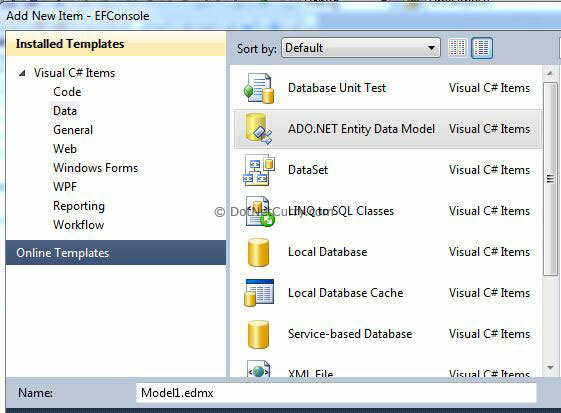 Select the Data Template > ADO.NET Entity Data Model and click Add. 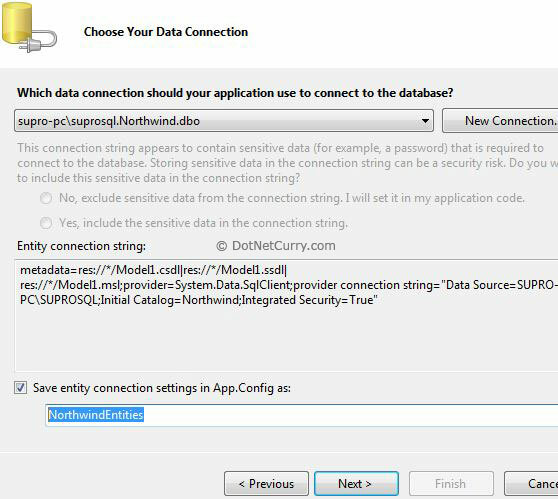 The Entity Connection Settings will be stored in the App.Config file as ‘NorthwindEntities’. 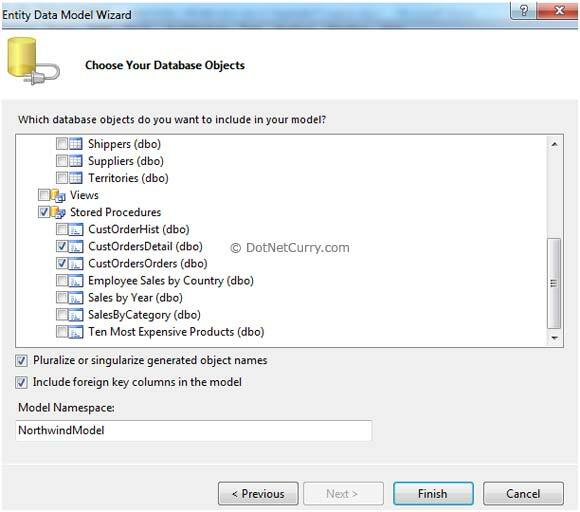 Step 3: Now choose the Database Objects you want to include in your Entity Data Model (EDM). This time, I chose two tables ‘Customers’ and ‘Orders’ as well as two Stored Procedures too as shown below, and renamed the model namespace as ‘NorthwindModel’. Click Finish to complete the wizard. Build the project in Release mode. A model defined by the Entity Data Model is ready and can now be used in your applications. 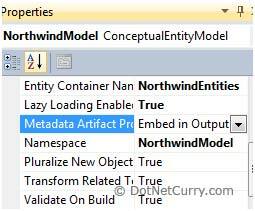 Double click to open the model and check it’s MetaData Artifact Processing property in the Properties window, which is by default set to ‘Embed in Output Assembly’, as shown below. This property is very useful in scenarios where you want to use the use the model in different projects. Since the model is created as a class library project (.dll), all you need to do now is make a reference to the .dll in your project and supply the connection string. The project using this model, finds the schema files (.csdl, .mls, .ssdl) through the metadata property. Remember that all the schema files are embedded into the .dll as resources. Open the App.config file and check the connection string entry, which contains the schema files entries, as shown in the screenshot below. Note: If you are new to schema files, read my article Exploring how the Entity Data Model (EDM) works. 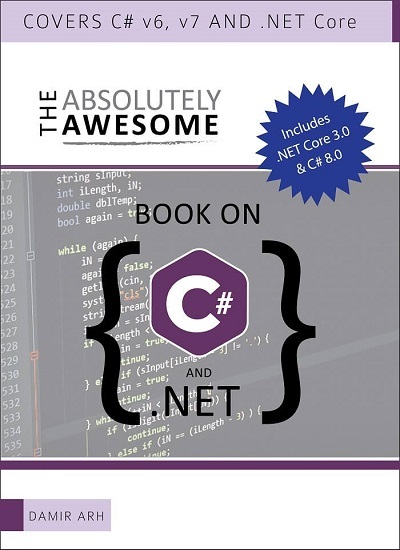 You can now use this model in multiple projects like a Console Application, ASP.NET Project, a Windows Forms project or a WPF Project. Make sure you have build the project (Go to Build > Build MyEntityModel) and there are no errors. We will now use the model we created above, in a Console Application. Step 1: Open Visual Studio 2010 > File > New Project > In the templates, select Windows > Console Application. Make sure the target framework is ‘.NET Framework 4.0’. I have called the application ‘ConsoleAppUsingMyModel’. Click Ok. Step 2: Let us now add a reference to the model we created earlier, in this console application. Right click the project > Add Reference > Browse Projects Tab and browse to the MyEntityModel project. 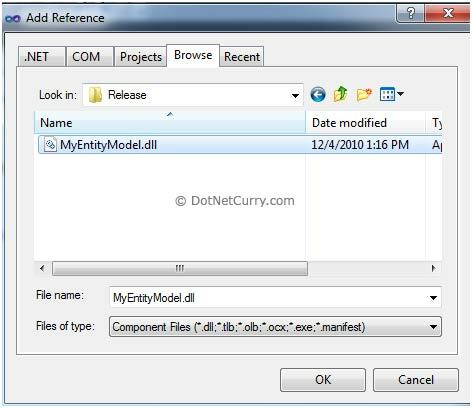 Go to the 'bin' folder > Release and select the MyEntityModel.dll as shown below. Click OK. Step 3: In this final step, our console application needs to have the information about the connection string which contains the metadata and details of the database connection. Note: If you skip this step and directly query the model, you will get an error The specified named connection is either not found in the configuration, not intended to be used with the EntityClient provider, or not valid. Now you can either create your own .config file in this project and add the connectionstring entry of your model or simply copy the App.config file that you created in the MyEntityModel project, in your Console App project. We will adopt the simpler way. Right click the project > Add Existing Item > Go to the MyEntityModel project and add the App.config file. Step 4: Once the steps shown above are completed, you now need to query against the model in order to fetch data. We will write code that displays the CustomerId and CompanyName of customers who have placed orders after the 1st of January, 1998. That’s it! You have now created a model that can be used in multiple projects. Check my entire Entity Framework 4.0 article series over here. A great article. Thanks for your work ! BTW, I hope you will keep writing more article about EF. I really think your work is very very helpful. Thanks ! Thank you very much for you articles, very useful and well formed. There are two different projects i.e., folders with in Data Objects layer [ Class Library] where both projects have same entity model (database). It is evident that being a single assembly CLR throwing the exception below. Previously found CLR type 'DataObjects.TestOrg.Entities.LocalState', newly found CLR type 'DataObjects.Org.Entities.LocalState'. Googling yeilds that this is known issue for a while. Is there any fix in the framework it self ? vaery useful ....no confusion only clarity. Works great when I use the Entity Model in a console application. But I can't get it to work in an asp mvc4 project!? where should the connectionstring go? I tried to add it to the web.config file under <connectionStrings> but that didn't work. Is it possible break down edmx to two separate project? for example one project Only be model and one project be context!? Can I use this approach for MVC3 project? I have 2 websites using the same Model. 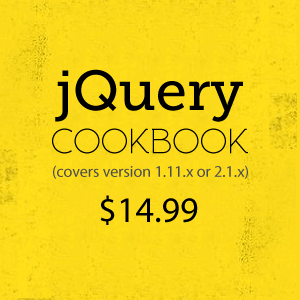 Can I put all the query in the Entity and create a dll then use it inside my MVC project? Hi, can you send me your email? Awesome!Worked like a charm. Thank you! Can you tell me how to create two app with sepaerate icon in single installation? No connection string named 'ABC' could be found in the application config file. one more thing i have created a folder inside the class library project with name of "App_Data" where i have placed the mdf file of database and made a respective connection string from wizard. @Nikhil: Which version of EF are you using? 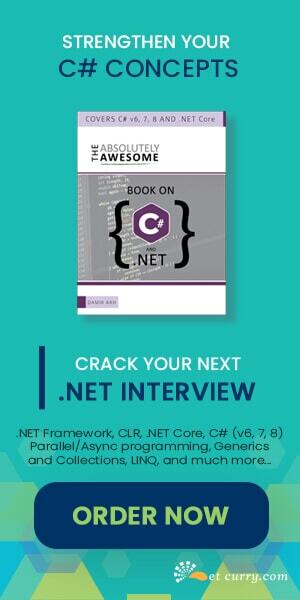 Did you try copying the connections string to the .config file in your ASP.NET MVC project?